In August, my mother died. Just uttering those words can cause me to catch my breath. I can hardly believe that I won’t see her sweet face again, won’t hear that wonderful laugh, won’t share another cup of tea or enjoy another conversation. But believe it I do and while my grief has at times been more than I can bear, I have chosen to focus less on what has left me and more on what has been left; on the memories that are keeping her close. My mother was real – truly brave, intelligent, beautiful, funny, and authentic. She was complex but not complicated, and she lived long, 86 years long – long enough to gather up some experience, some real life, some wisdom, some grace. Much of this she shared with me during the time we spent living together during the past 20 years. What’s wonderful about sharing someone’s later years is that they have time to sit and chat, to impart their insights and to share their stories. And while my mother didn’t spend much time sitting, she did spend her time telling- stories that have helped me shape my own thoughts about the world we live in and the one we leave behind. When someone dies, the details of death take over your time and space; they cloud your vision. You fill your days with plans, finding a way to honour their life, embracing friends and family, comforted by the company, and knowing this too shall pass. At some point though, you are alone again, with your grief, and for me, with my gratitude. I am so grateful she chose ‘family’ and that she had sons so I could have brothers. She told me once that all she ever wanted was ‘to have children’ and I am so glad she did. I could not love those boys more, they have made my life rich and so much better for having had them in it. I learned a great deal from my mother; there were many lessons. She taught me at an early age, that we are all ‘people’, and equal and that “there is no difference between men and women, other than the obvious” so I could do or be anything that I put my mind and heart to. I grew up knowing that I could make my own path, and that she would not get in my way, that nothing was beyond reach unless I chose to lower my own sights. She taught me not to waste time or talent. She understood that life is finite, and that time starts running out from the moment it starts running. She was a life long learner. She encouraged me to find out what words meant, study maps, listen to the news, read books, join groups, learn new skills and new languages. 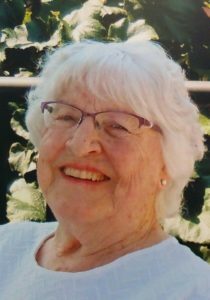 She was forever ‘learning’ something new – driving in her 20’s, skiing in her 30’s, tap dancing at 75, Bridge at 79, Gmail at 85. She played games and played sports – and practiced them all until she got it right. She was constantly ‘moving’. She loved music and dance. She sang in choirs, and played her accordion in an orchestra. She danced on kitchen floors and dance floors, by herself and with her husband, in classes and with groups of friends. She stretched every day of her life, did yoga on the living room floor, wore copper and magnets and became a reflexologist later in life. She never missed her massage, and was open to the ‘alternative’. She promoted natural health long before it was natural to do so and questioned everything. If she was given a new supplement, the bottle wasn’t opened until she had done her research. She lived through a World War, lived through a long marriage, lived through 86 years of living. She told me you cannot do that without learning a thing or two. She had a terrific sense of humour. I loved the way she laughed and the way she made us laugh. She was so very funny, she saw the lighter side, the brighter side, and while she couldn’t tell jokes, she sure could take them. There were moments when we laughed so hard we cried; moments I will cherish. She was brave and strong and tenacious and endorsed a ‘no whining policy’. She taught us all that there is always someone who is struggling more than us, having a more difficult life than us. She worried about the human condition, about those with little or less, and those who would never have a lighter load. We were not afforded much time for self pity, and while I thought at times, she was hard when she could be soft, she was quick to point out that she had endured enough to know that we would always be better off than those before us and we had a duty to make the most of our lot in life. She was a ‘maker’ and felt the world was losing its ability to ‘create things’. She could cook. She taught me how to follow a recipe and how to create my own. She made the most of the season, didn’t waste food and knew how to create more with less. She cooked from scratch, because ‘food shouldn’t be fast’, used real ingredients, even made her own yogurt long before it became mainstream; her pastry and scones were the best I’ve tasted. She sewed her own clothes and many of ours, knitted sweaters, made her own Christmas ornaments, fixed things when they broke. She made things last, respected what she owned, took ‘care’ of her things. My mother was not afraid of death, she considered it ‘part of living’. She was prepared; had the tough conversations, signed the necessary papers and even planned her ‘celebration of life’. We were blessed in the final few hours – she didn’t suffer from disease, her mind was intact, her body without pain. She chatted with children and grandchildren, knew what was happening, and spent her last few hours in peace and in a place of grace. She spent only one night in hospital, no machines, no tubes or wires, just a lovely room in a warm bed surrounded by love. I stayed with her that night, not knowing it would be her last, and just before we turned the lights out, she spoke her final words “You’ve been an awesome daughter and I’ve had a wonderful ride”. For me, as a writer, that’s a great ending to a beautiful story. While she may be gone, she will never truly leave me and I am so very grateful to have been part of her journey and for the legacy she left behind; lessons and love, the only things that last.